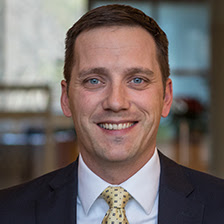 Nate Dosch has joined First Business Trust & Investments with more than 10 years of combined experience in private legal practice and in public accounting focusing on tax, estate and succession planning strategies for high-net worth individuals and families. He earned his J.D. from Marquette University Law School, his M.S. in Taxation from UW – Milwaukee and his B.S. in Business Administration from North Dakota State University. Nate is active in a number of youth sports programs including Menomonee Falls Little League, Brookfield Indoor Soccer and Upward Basketball at Elmbrook Church. He resides in Menomonee Falls with his wife and two boys.